Inner Join returns only the matching rows in both the tables (i.e. returns only those rows for which the join condition satisfies). Demo 1: As per the data in our demo tables, Customers with CustomerId 1 and 3 in Customers table have the orders in the Orders table. Where as the customer with CustomerId 2 doesn’t have any order in the Orders table. 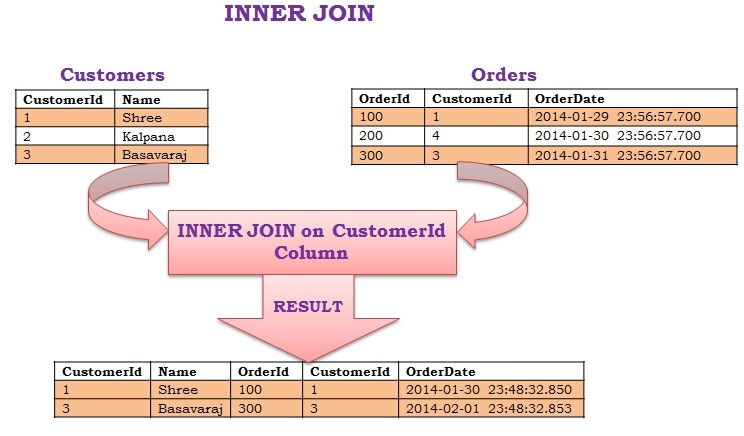 So the Inner Join on the CustomerId column between Customers and Orders table will return the Customer and Order details of the Customers with CustomerId 1 and 3 only. Demo 2: Below Inner Join query demonstrates how to get name of all the Customer who have at-least one order in the Orders table. Left Outer Join/Left Join returns all the rows from the LEFT table and the corresponding matching rows from the right table. If right table doesn’t have the matching record then for such records right table column will have NULL value in the result. Demo 1: As per the data in our demo tables, Customers with CustomerId 1 and 3 in Customers table have the orders in the Orders table. Where as the customer with CustomerId 2 doesn’t have any order in the Orders table. So the Left join on the CustomerId column between Customers and Orders table will return the Customer and Order details of the Customers with CustomerId 1 and 3 and for CustomerId 2 the Order Table columns will have NULL value in the result. Demo 2: Below query demonstrates how to get the name of the Customer who don’t have Orders using LEFT OUTER JOIN. Right Outer Join/Right Join returns all the rows from the RIGHT table and the corresponding matching rows from the left table. If left table doesn’t have the matching record then for such records left table column will have NULL value in the result. Demo 1: As per the data in our demo tables, only for the order with OrderId 200 we don’t have it’s corresponding customer info with CustomerId 4 in the Customers table. And for the other two orders, the corresponding customer info is present in the Customers Table. So for the orders with CustomerId 1 and 3 will have customer details and for the order with CustomerId 4, the Customers table columns will have NULL value in the result. It returns all the rows from both the tables, if there is no matching row in either of the sides then it displays NULL values in the result for that table columns in such rows. 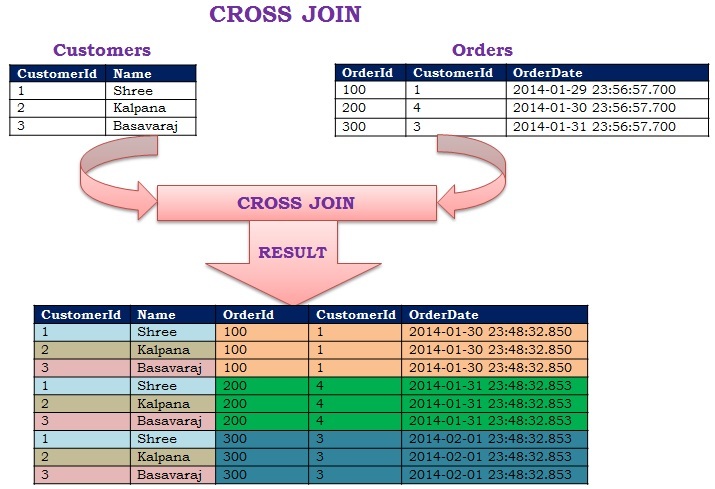 Demo 1: As per the data in our Demo tables the Customer with CustomerId 2 doesn’t have order in the Orders table. 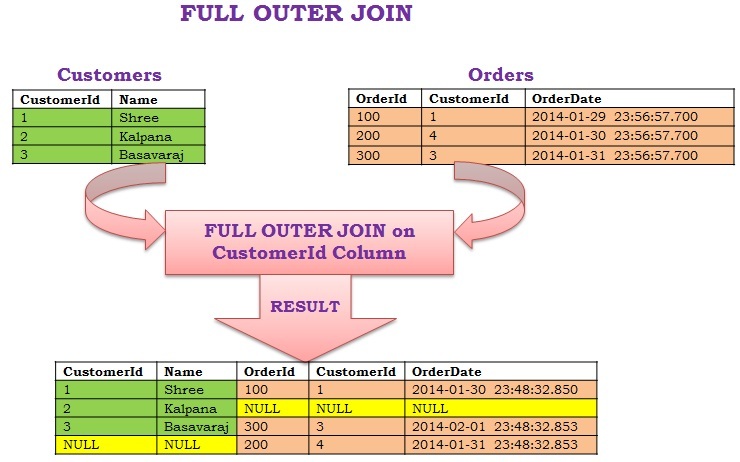 So in the result of FULL Outer join between Customers and Orders table on the CustomerId column will have NULL values for the Orders table columns for the Customer with CustomerId 2. And for the Order with OrderId 200 having CustomerId 4 doesn’t have a matching record in the customer table with CustomerId 4. 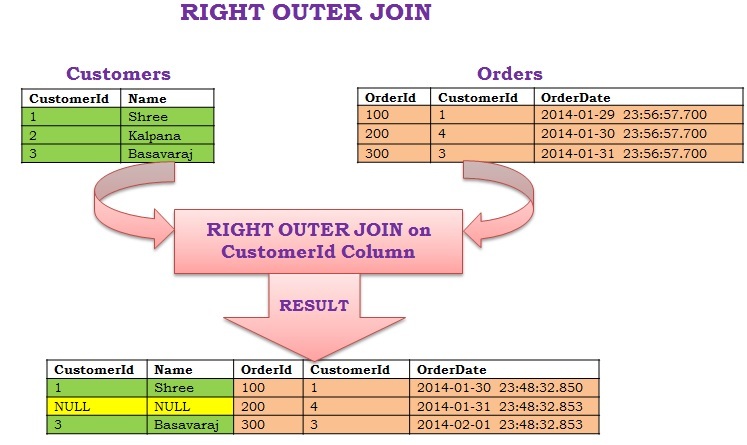 So in the result of FULL Outer join between Customers and Orders table on the CustomerId column will have NULL values for the Customers table columns for the Order with OrderId 200. 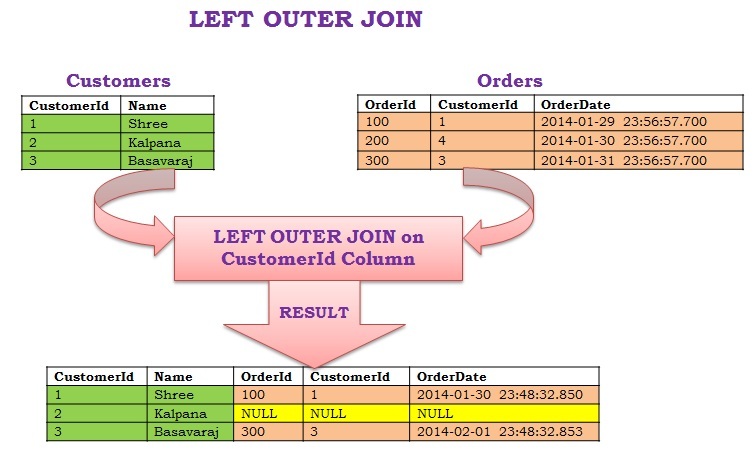 Demo 2: Below query demonstrates how to get the list of all the Customers without Orders and also the Orders which doesn’t have corresponding customer in the Customers Table. Cross join is also referred to as Cartesian Product. For every row in the LEFT Table of the CROSS JOIN all the rows from the RIGHT table are returned and Vice-Versa (i.e.result will have the Cartesian product of the rows from join tables). If a Table is joined to itself using one of the join types explained above, then such a type of join is called SELF JOIN. What will be the result of cross join if one table contains no records? No row in the result. nice blog and post, but i have a question, when i have a mutiple joins ( inner, right or left) in the same query, which is the “right “or “left”table? in my first inner i know wich is my left(t1) or right(t2) table, but on the next left join my “left table” is the result of the first inner join? or just t1? or just t2 ? can you help me pls ? Answer is depend on which table column will you select in select statement . Will try to write it at the earliest. For this month plan is to write only the Sql Server 2016 articles. Nice Article. Keep doing the good work. That’s the best explanation for JOIN types I’ve found on the internet, thanks for much! Made my life easier!